Some 12s never have an off-season, never a time to rest. Eye of the Needle Winery has a selection of fan wines, the 12th Blend line-up, that work year-round to fight hunger. 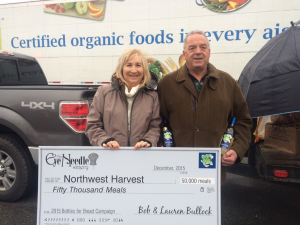 With their Bottles For Bread campaign, Eye of the Needle has provided 150,000 meals through contributions to Northwest Harvest that serves 350 food banks in Washington State. For every bottle of 12th Blend wines sold, Owners Lauren and Bob Bullock, donate enough money to provide two hungry neighbors with a meal. “It drives us crazy that anyone is wondering where their next meal is coming from,” says Lauren. These give-back bottles are more than simply do-gooders, they are good wines available at an affordable price. Awards for the white blend have come in the form of Platinum “Best of the Best 2016” from Wine Press Northwest, Gold at the 2015 Seattle Wine Awards and Silver Medals from the San Francisco Chronical Wine Competition and the San Diego International Competition. The red took Double Gold “Best of the Best 2016” from Wine Press Northwest and Best-In-Class at the San Francisco Chronicle Wine Competition 2015. Winemaker Bob masterfully blends his own crush, using fruit from some of Washington’s top producers. That skill and care is the reason Eye of the Needle wines are award winners. Between the accolades and the giving goodness the 12th Blend wines represent, it is no small wonder that these wines are constantly sold out at area retailers. Eye of the Needle also has their main line of wines including Private Eye, a blend of Merlot and Cabernet; Harvest White, a blend of Viognier, Chenin Blanc and Gewurztraminer—a 2015 Seattle Wine Awards Gold Medal winner (and a past winner of the SWFE BEST WHITE IN SHOW 2014); and The Eye, a proprietary blend that took a Silver Medal at the San Diego International Competition. 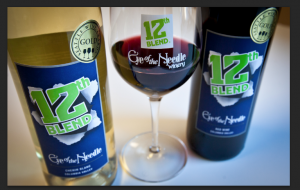 Stop by Eye of the Needle’s exhibit at the Seattle Food and Wine Experience, Sunday, February 21st, to taste what the 12th Blend excitement is all about and chat with Lauren and Bob. 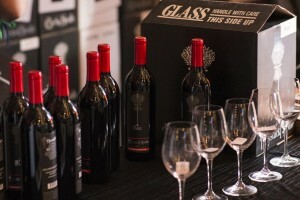 They will also be offering samples of Bob’s Little Italy Red—a blend of Sangiovese, Dolcetto and Barbera—and the 2012 Reserve Merlot, releasing that day with a Double Gold already awarded from the San Francisco Chronicle Wine Competition 2015.